Crisp black and white stripes with a bright bold coral are a summertime favorite combination of mine! Chico’s asked me to try out their new Comfort Waist Luxe Utility Pants and I couldn’t say no to this fun Malibu Punch color or the comfy waistline! Lightweight and comfortable, these ankle pants will be a summer favorite. The waist looks like a tailored fit pant waist, but feels like a stretchy elastic waist band. Win/Win! Pick your normal Chico’s size for a relaxed fit or go down one size if you prefer a more fitted look. I’m wearing Chico’s size 00. Made of cotton, rayon, and spandex. Available in six colors. I’m all about stripes and we can’t go wrong with classic black and white. This pretty top adds fun circle cutout details on the sleeves. Made of polyester and rayon, it won’t wrinkle and will be easy to wash.
Loving this chunky modern-art inspired necklace and earrings. You know Chico’s always has the best bold jewelry around! Rounding out the look, my classic Rebecca Minkoff Mab tote, ASOS square sunglasses, and heeled gladiator sandals. 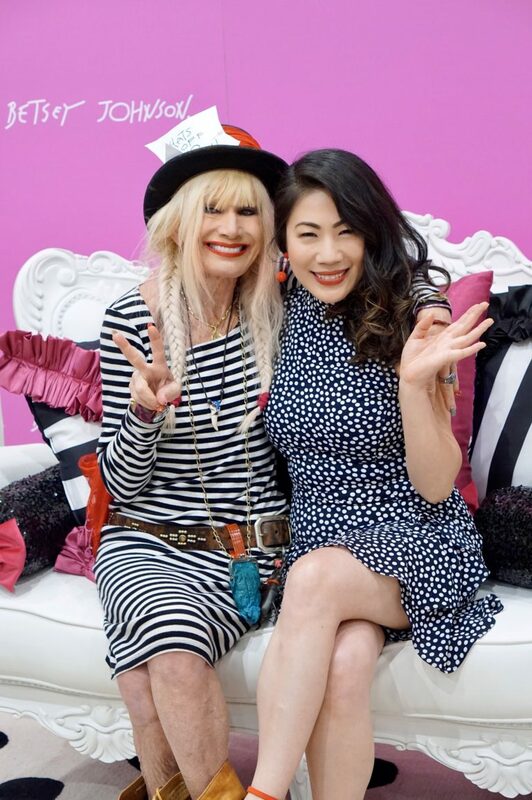 Grace of Color and Grace meet Betsey Johnson! I’m SO jelly! Also on the blog this week, styling tips for palazzo pants and these super comfy summer sandals. Don’t forget to link up and join in the fun, Dolls! I’ll have to check those pants out at Chico’s. A lightweight casual pant is such a necessity in summer! Those pants are lovely, what a great colour! 🙂 And of course I like the striped top with it, yey for stripes! Love those pants!!!!! So cute! Coral is one of my favorite colors and I love how you styled it with stripes! Happy Friday! This entire look screams fabulousness, Dawn!! Those are so cute!! I love them! You look stunning. These pants are awesome. A must-have. Cool color! And perfect with those stripes! Have a great weekend! Love this color combo! The pants are so chic too. Thanks for the link up! Love what you selected from the Comfort waist collection from Chico’s Dawn! I bet the outfit is comfortable and perfect for summer. Love your fun pant color with the stripes. Loving the color mix Dawn, so bold and chic. Thank you for the link up!! Such a great outfit, Dawn Lucy! I love this color combination, too. Those pants are darling and ever so cheerful! Just wanted to let you know that this post will be a featured favorite on today’s link up! Going live soon! Dawn, I love these pants. I read your post about your dislike of shorts and I’m with you. I’m always looking for other options and I lean more towards pants than dresses due to the fact that pregnancies left my legs as road maps to I don’t know where! Anyway, thank you for hosting another great link up!